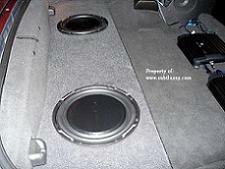 2005-2013 C6 Corvette dual 10 sub box. Cutout size: 10= 9-1/8" 12"= 11-1/8"
Now you can install two subs in your C6 Corvette Coupe or Z06 more affordably than ever before. 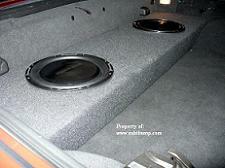 Our dual upfire box installs easily over the fenderwells and locks in behind them. 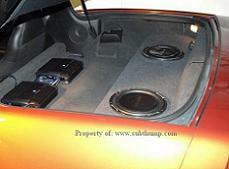 The design allows the targa top to be stored without interference from the box or movement from the subwoofers. If needed, the box can easily be removed without any tools in well under a minute.